Yesterday we had a blast with our interview with the personable and knowledgeable Joy Bauer, and today we’re happy to be reviewing her fun and encouraging workout DVD that’s perfect for beginners! 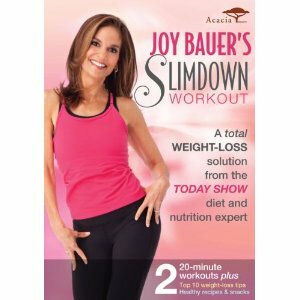 Joy Bauer’s Slimdown Workout for Acacia is just about everything you could ask for in a beginner’s workout DVD. It’s fun, has mix-and-match options, includes a variety of exercise moves so you never get bored, and it includes work on the three factors that make for a truly fit body: strength, cardio and core. Oh, and all you need is yourself, a mat and a dumbbell. Score! After a quick easy-to-do 5-minute warm-up with Joy and accompanying instructor Lisa Wheeler, you get two 20-minute workouts that can be done on their own or together, followed by a 5-minute cool down with stretching. Both of the 20-minute segments include cardio moves like grapevines, kicks and V-steps, along with strength moves such as lunges, planks and push-ups. While the first segment is a bit easier than the second, both feature moves that can be modified to any level of exerciser—including ways to increase the intensity as your fitness improves. While there’s nothing overly fancy or crazy about this DVD, it is fun with some easy-to-do dance moves, and you can really see that Joy and Lisa are having a good time. In the beginning of the first segment they seem to be a little uncomfortable co-teaching (their extreme height difference is also somewhat entertaining), but they figure it out after the first 10 minutes and really work together well. The DVD also features bonus segments with Joy including her top weight-loss tips and even healthy recipes. We love! Fit Bottom line: The perfect DVD for beginners that walks the fine line of being challenging but not too challenging. Plus, with a nice mix of strength and cardio moves, it’s a fab quick total-body workout selection!